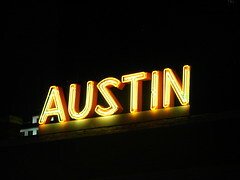 Austin, Texas~no place like it! Originally uploaded by Texas to Mexico. I just spent my first time in Austin, Texas in five years and I can’t for the life of me figure out what took me so long. I lived in Austin a few years back for a short while and when I lived in Houston at the end of 90’s I would escape to “The Promised Land” – as we called Austin – nearly once a month as way of keeping sane. Not only is there more cool stuff to do - shows to see, places to run, some of the best food and drinks on the planet - there are a few dear friends there. From the moment I landed my time was almost non-stop with these friends – some re-connecting after years, some just picking up where we last left off. Unlike my solo world in which I exist in Denver living by myself, plenty of introvert time, and probably a degree of too much time alone, this was not so in Austin. It was so very good. In the wee hours, though, I would suddenly be wide-awake. Lying there, all the jumble of interactions from the day before would spin around like a dust-devil cloud, eventually slowing to settle down on the ground of my soul. It was then I heard the conversations I’d had hours earlier; I heard more of what was being said underneath the words, in that which was spoken by my friends’ presence… and those wordless-words were powerful, life-giving, revealing – not only of them but of my own soul. I heard fears, mistrust, affirmations, strengths, graces given and received, stories being told that started years before we met, foreshadows of where the story might turn next; I heard the goodness of a history shared, and the awe-struck giggle in the choreography that brought about our friendship. And for all the pain we all carry with us, I heard peace that words could never express that comes on the backside of darkness. The words we don’t speak linger far deeper, longer than anything we say with our mouths. As I head into the next chapter of this road trip month - Indiana, then Nashville and Memphis this week – I am still soaking up, still learning so much from my friends I’ve left in Austin. George Macdonald created a phrase called, “The Wide-Awake Real,” when speaking of what life can be like if we trust enough to receive what is waiting to be given us, shown us, about not just ourselves but those we love. I feel I get glimpses of this “Real,” and because I am human I can’t take it in – as Imogen Heap sings.